The summer is heating up here in Houston and the instability in the oil market continues to heat up as well. Many of us have experienced a very rocky road over the last several months, thus I will try to keep my note positive. I won't reiterate the same points many other Presidents of associated geological societies have already made, but I will say that I hope this, too, shall pass. Being relatively new to the oil industry, I expect this first slump (for me anyway!) will be the first of many bumps in the road during my career. Having asked some of my mentors how many slumps they have experienced over their careers, the splitters have counted upwards of 16 individual slumps, whereas the lumpers count 7, including the current downturn. Whether you count 7 or 16, those numbers are a sign of an ever-changing industry. Keep your skills sharpened and be at the top of your game! Speaking of keeping your skills sharpened, I highly encourage each of you to attend the upcoming GCAGS conference here in Houston, Texas on September 20-22, 2015. This year's conference theme "Discovery, Technology, Education, and Leadership" represents four core values of previous and future progress in our industry. Without these fundamental principles, we would still be living in the dark ages! I task each of you to participate in even more creative ways to keep the momentum going through the 21st century. This year's robust technical program includes topics in seismic interpretation, global exploration, deepwater field case studies, salt tectonics, reservoir quality, unconventional resources, geophysical technology, and petroleum systems. Nineteen technical sessions are composed of 94 oral and 86 poster presentations. In addition, 9 short courses, 7 field trips, 3 luncheons and 2 forums will be offered. The icebreaker party, late afternoon receptions, and a special evening at the St. Arnold Brewery will offer ample opportunity to catch up with old friends and meet new ones. In all, this will be a fantastic conference and it could not have been put together by a more capable team of professionals. A number of awards will be presented at the opening session on Sunday afternoon. I am pleased to announce that Dr. Paul Weimer from the University of Colorado will receive the 2015 GCSSEPM Doris Malkin Curtis Medal for his outstanding research contributions towards the development of new concepts for understanding the geology of the Gulf of Mexico. Rick Beaubeouf will receive the 2015 GCSSEPM Distinguished Service award. I am also happy to announce the Grover E. Murray Best Published Paper Awards from 2014. Kathleen S. Haggar, Les R. Denham, and H. Roice Nelson, Jr. won first place. C. Hans Nelson and John E. Damuth won Second Place. Erik Scott and Wayne Abraham won Third Place. Please join me in congratulating these winners for their contributions to geology and our societies. More information about the awards and our awardees will be posted to the GCSSEPM website soon. The GCSSEPM Luncheon will be held on Tuesday September 22. 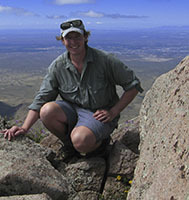 Rob Lander of Geocosm in Durango, CO will deliver a presentation entitled "Model the Rock! Using Diagenesis Simulation for Rock Property Prediction." Rob co-founded Geocosm LLC and co-directs the company's Consortium for the Quantitative Prediction of Sandstone Reservoir Quality (RQC), which was established in 2001 and currently has 23 members. He has published a number of papers on topics involving diagenesis and reservoir quality prediction (including several notable papers in the AAPG Bulletin) and received the Wallace E. Pratt Memorial Award for best paper published in the AAPG Bulletin in 2010. Rob is currently a 2014-2015 AAPG Distinguished Lecturer. We look forward to an exciting and interesting talk from Rob! The 2015 GCSSEPM Perkins-Rosen Research Conference themed "Petroleum Systems in 'Rift' Basins" will be held in Houston, Texas on December 13-16. 42 technical abstracts have been accepted and we certainly look forward to a well-themed conference! In similar fashion to the 2014 conference, a Student Poster Competition will be held. Students entering the competition will receive free admission to the conference, have their abstract published with the conference proceedings, will receive an invitation to the 1-day exploration-themed short course and have a chance to win cash prizes! We encourage all students to submit their abstracts...the deadline is November 6. Please see the advert in the newsletter for more details. Conference registration is now open and please see www.gcssepm.org for details. Thanks again to all of the volunteers that comprise the Conference Committee, including the Technical Co-Convenors, Coordinator and Technical Program Committee…this conference would not happen without your hard work and efforts! I look forward to seeing everyone at the conference! With the help of the Executive Council, I would like to welcome and acknowledge our 2015 Student Representatives: Adrian Gittens (University of Houston), Sebastian Cardona (University of Texas at Austin), Bronwyn Moore (Texas A&M University), Michael Roman (University of Oklahoma), Shanna Mason (University of Louisiana at Lafayette), Marie Thomas (Louisiana State University, Christian Haller (University of South Florida), Steve Brennan (Colorado School of Mines), Alex Conti (Ohio University) and Levent Akinci (Ohio State University). Our student representatives act as our direct point-of-contact to a variety of universities that GCSSEPM has built a relationship with through the years. If you have any suggestions for new student representatives from universities or colleges not listed, please contact Sophie Warney: swarny@lsu.edu. Thank you for all of your time and efforts, students! We look forward to continuing our interaction! I will conclude with an initiative that Past-President Carl Fiduk started in 2014. Each year, the Foundation Trustees and Executive Council will choose one Ed Picou Fellowship Grant awardee's research to be highlighted in our Fall Newsletter. Keep your ears and eyes peeled!